Colgate-Palmolive Company, together with its subsidiaries, manufactures and markets consumer products worldwide. It operates in two segments, Oral, Personal, and Home Care; and Pet Nutrition. The company is a Dividend Achiever and a Champion. Colgate-Palmolive has paid uninterrupted dividends on its common stock since 1895 and increased payments to common shareholders every year for 46 years. From the end of 1998 up until December 2008 this dividend growth stock has delivered an annual average total return of 5.90% to its shareholders. 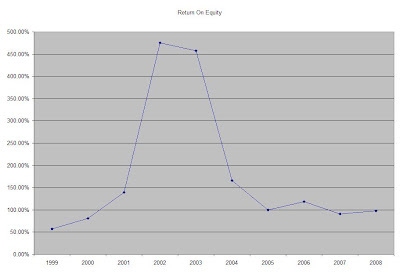 While the stock has largely remained flat for the majority of the past decade (except for the breakout in the stock price in 2007) most of the returns came from reinvested dividends. At the same time company has managed to deliver an impressive 10.70% average annual increase in its EPS since 1999. The ROE has consistently remained high, ranging between 57% and 475% over the past decade. Annual dividends have increased by an average of 11.40% annually since 1999, which is slightly higher than the growth in EPS. An 11 % growth in dividends translates into the dividend payment doubling almost every six and a half years. If we look at historical data, going as far back as 1977, Colgate Palmolive has actually managed to double its dividend payment every eight years on average. Just a few weeks ago Colgate Palmolive boosted its dividend by 10% for the 46th year in a row. The dividend is very well covered at the moment. The dividend payout has ranged between a high of 51% in 2006 and a low of 33% in 2002. One positive fact is that the payout ratio has consistently remained below 50%. A lower payout is always a plus, since it leaves room for consistent dividend growth minimizing the impact of short-term fluctuations in earnings. Despite the low dividend payout ratio and low P/E ratio, I require a dividend yield of at least 3% in order to initiate a position in Colgate Palmolive. Currently the yield is at 2.80%, and price earnings ratio is 17. In comparison Procter & Gamble (PG) trades at a P/E multiple of 12 and yields 3.40%, Kimberly-Clark (KMB) trades at a P/E multiple of 13 and yields 4.70%, while Clorox (CLX) trades at a P/E multiple 14 while yielding 3.60%. I would consider initiating a position in Colgate Palmolive on dips below $58.66. Get an updated Trend analysis for CL, KMB, PG and CLX.